It is more than 35 years since he was shunted out of office, but the thought of Richard Nixon‘s finger on the nuclear trigger still has the power to terrify. Now it has been revealed that the highly erratic president’s metaphorical digit was hovering even closer than was widely realised as his administration laid plans for an atomic strike against North Korea in 1969 following the shooting down of a US spy plane. According to newly revealed government documents, Nixon is even believed to have ordered nuclear bombers to be put on standby for an immediate strike after North Korean jets downed the American plane as it flew over international waters collecting electronic and radio intelligence. President Nixon pointing to the transcripts of White House tapes in April 1974, after he announced that he would give the material to lawmakers and make them public. 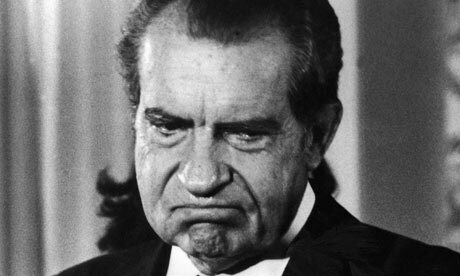 WASHINGTON — On Jan. 23, 1973, when the Supreme Court struck down laws criminalizing abortion in Roe v. Wade, President Richard M. Nixon made no public statement. But privately, newly released tapes reveal, he expressed ambivalence. Nixon worried that greater access to abortions would foster “permissiveness,” and said that “it breaks the family.” But he also saw a need for abortion in some cases — like interracial pregnancies, he said. Highlights from newly released recordings of former President Richard M. Nixon by secret microphones in the Oval Office in 1973. Editors’ Note: Contains language that may be offensive. Discussing Israel’s shooting of a Libyan plane and domestic religious tension, with the Rev. Billy Graham. RICE: The president instructed us that nothing we would do would be outside of our obligations, legal obligations under the Convention Against Torture. So that’s — And by the way, I didn’t authorize anything. I conveyed the authorization of the administration to the agency, that they had policy authorization, subject to the Justice Department’s clearance. That’s what I did. Q: Okay. Is waterboarding torture in your opinion? RICE: I just said, the United States was told, we were told, nothing that violates our obligations under the Convention Against Torture. And so by definition, if it was authorized by the president, it did not violate our obligations under the Convention Against Torture.